BTS dropped the music video for “작은 것들을 위한 시 (Boy With Luv)” feat. Halsey, and it’s broke a new record for the most views in 24 hours – no thanks to Youtube which deleted 10 million views! When BTS released the music video for “IDOL” last summer, the global superstars were able to rack up over 50 million views! They were able to break what was the the current record for the biggest music video debut on YouTube. Unfortunately, YouTube only recognized about 45 million of those views and took to deleting the rest. By now, ARMYs are used to the platform freezing and deleting views on BTS’ videos, which is why the fandom has set the goal to get 100 million views this time around, knowing that millions of views will be deleted in the end. To show just what happens to BTS, we’ll be tracking and updating this post with the views being counted on the “작은 것들을 위한 시 (Boy With Luv)” music video! For those that are still confused on how to properly stream, be sure that your views will actually count! This means avoiding watching the video on a loop, as your views will not be counted this way. To get your view to count, you have to watch the video, then watch other videos, and then return to BTS’ music video again. Check out this handy guide for more information on how to avoid looking like a bot! 💜The “Boy With Luv” music video was released on April 12, 2019 at 5:00 a.m. ET! 💜After less than 20 minutes, the views seem to have already frozen at 493,508 views! 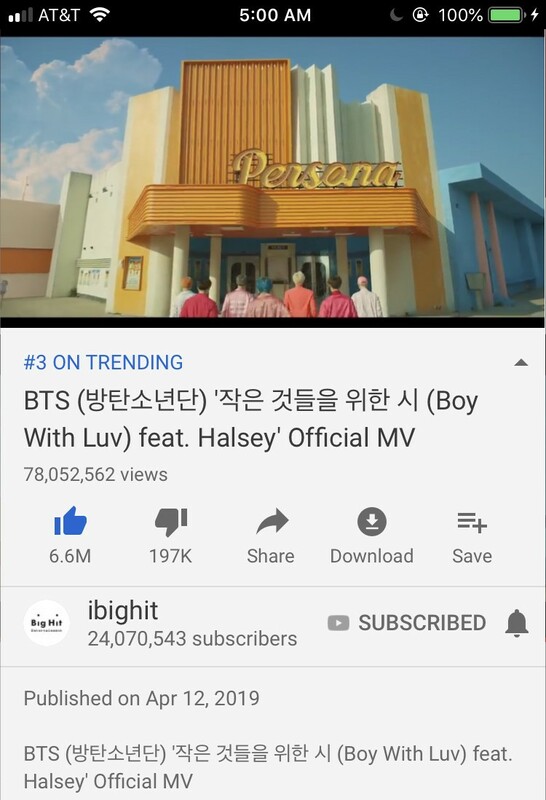 According to Youtube the “Boy With Luv” music video got 74.6 million views in 24 hours (about 4 million less than what was showing online at the actual time) which still breaks the record, but shows how incredibly messed up the platforms system is.